Julie Powell: The truth is, no one knows about me. I feel like I’m just sending things out into this endless void. In 2002, struggling New York writer, Julie Powell started a blog, called “The Julie/Julia Project”. In 2004, I started a blog and if you’re reading this right now, then you are likely reading my blog. And I, like Julie, often wonder if there is anyone out there reading these words that I spend so much time toiling over or, on more fortunate occasions, delighting in. She, like me, sometimes lacks the faith and the strength to believe that there is an audience, that there will be a bigger one and that all of this work will lead to the right person at the right time taking note of it and subsequently plucking her (or me) from her life (or mine) and dropping her in the middle of the one’s she’s only dreamt of. The major difference is that Julie has a secret weapon – Julia Child. I apparently need to get me one of those. 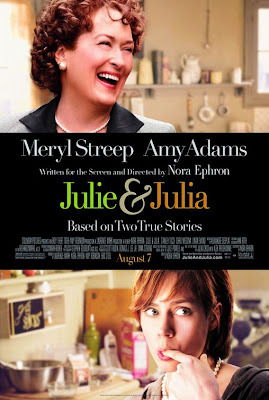 JULIE & JULIA is based on not just one but two true stories. Writer/Director, Nora Ephron, who hasn’t directed anything since 2005’s BEWITCHED and hasn’t directed a hit since 1993’s SLEEPLESS IN SEATTLE, returns with a structure that is not so dissimilar to her Tom Hanks/Meg Ryan romantic comedy classic. Ephron must balance her story between two times and places as Julie Powell (Amy Adams) blogs and cooks her way through Julia Child’s cookbook and Julia Child (Meryl Streep) learns to become well, herself. Both ladies are lost before taking on their new challenges; both have strong, supportive men in their lives who make them better people (Chris Messina for Julie and Stanley Tucci for Julia); and, fortunately for Ephron, both ladies are effortlessly talented and consistently compelling to watch. 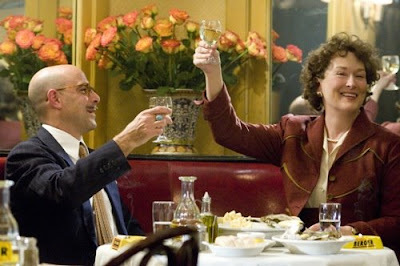 Ephron plays things too safe for JULIE & JULIA to have a profound impact on the viewer. The obstacles the two women face seem more contrived than plausible and therefore, their triumphs never take on the significance necessary to inspire the viewer. This is particularly disappointing considering this is a movie about following inspiration and daring to dream. Still, the talented cast manage laughs whenever they can and Streep’s performance is so boisterous that it elevates the whole thing from, in restaurant review terms, a 2-star to a 3, but given what they had to work with, it could have easily been a 5 under the command of a more skilled chef. Thank you, Jim. Did you like the movie?